Treat yourself to affordable yet practical luxury with the Harmar SL600 Pinnacle Premium Stairlift. What is already the lightest and most slim stair lift on the market can be folded to take up even less room, only 11 inches of stairway space. 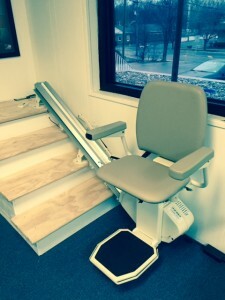 Don’t let its lightweight frame deceive you, this is a decidedly heavy duty stair lift, with the ability to support up to a 350lb weight capacity. In addition, the Harmar SL600 Pinnacle Premium Stairlift has a comfortably wide seat, made even more comfortable with its swivelling ability, which helps one safely mount and dismount the stair lift. Built with safety in mind, this stair lift comes equipped with sensors that will prevent it from moving if there is an obstruction on the stairway. This model also boasts an industry first: an automatic fold design which removes obstructions at the bottom of the stairs. Pinnacle’s patented helical worm gear drive system will guarantee more trips before you have to recharge. This stair lift boasts up to 40 trips before the power goes out. Pinnacle stair lifts require much less energy to operate compared to other leading stair lifts on the market. Owners of this stair lift will appreciate that Pinnacle’s proprietary drive system will not require the use of messy lubricants or greases. With unmatched attention to detail in both functionality and aesthetics, the Harmar SL600 Pinnacle Premium Stairlift will blend right into one’s home without looking out of place.